At a crossroads? Wondering which way to go? Wish you could just open up the Bible and have it spelled out for you? I get it. Sometimes the discomfort of “being in the waiting room”, trying to find wisdom and do the “best thing” can be paralyzing and we just don’t make a decision at all. Which, in reality, is making a decision, right? When we need wisdom, God promises to give it to us (check out James 1:5). But sometimes we can doubt whether we will really get wisdom (read all of James 1 to see what doubting does to our ability to obtain wisdom), or we think the wisdom of God is not what we want. The unredeemed mind cannot even understand God’s wisdom. We need God’s grace and the Holy Spirit to open our eyes (see 1 Corinthians 2:14). Sometimes, though, we can grow impatient and try to find wisdom elsewhere. It seems easier. Someone can just give us advice to follow. Or we can just go with “whatever feels good”. These solutions on our quest for wisdom do not fully satisfy, though. And they might just lead us further away from finding wisdom. There is only one place where wisdom is found. One. A closer look at James 1 reveals that God does not want to torture us with hiding wisdom from us. He wants to give it to us – generously. To all. Without finding fault. But when we come to see wisdom, we have to lay down our agendas and truly want His will for our lives. Job had his own struggle with understanding wisdom. He felt the very real pain of suffering and did not see any purpose, value or wisdom in why God would allow it. So he questioned God. Have you ever been in that place? We wonder what God is up to and can evaluate life from a “fairness” or “entitlement” perspective until we truly encounter God. Suddenly, as we enter the presence of God, we see that our pursuit of wisdom was blinded by pleasing self. Job found the truth and He found wisdom. He discovered that wisdom begins with the fear of God. When he had been seeking God before, it was for relief from his suffering and accusations that he leveled against God. But after suffering and seeing God through that affliction, God asked Job a series of questions of Job, and Job understood the fear and reverence of the LORD. Solomon expressed this in Proverbs, (Proverbs 1:7, Proverbs 2:11, Proverbs 8:12-13, Proverbs 9:10-11, and Proverbs 15:33) and so did the Psalmist (Psalm 111:10). Will we find wisdom? 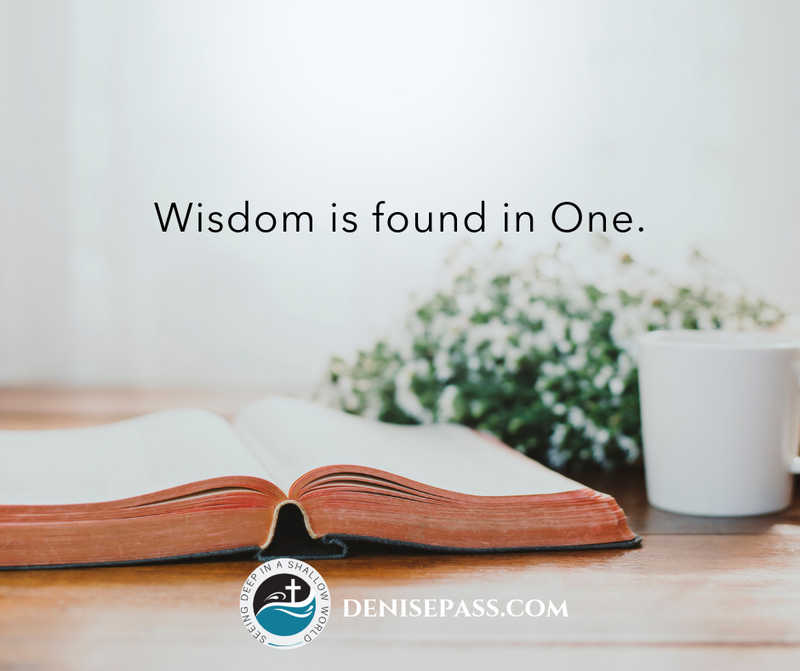 Seeking wisdom might mean asking God questions, too, but how we ask questions can be the difference between finding wisdom or spinning our wheels. Will we come doubting, or truly seeking understanding and wisdom laying down our understanding and picking up Christ’s? The word of God is our guide. While it might be hard to find wisdom, anything worthy of being found is worth seeking for. Will we truly seek?